Cataloging, assessment, reference, instruction....there are so many task that a librarian is expected to keep up with. With a constrained budget, its hard to be everything to everyone. 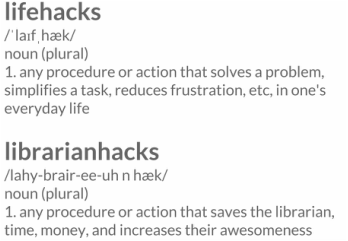 This blog introduces a number of library hacks, mostly focused on free and cheap technology, to help librarians/libraries with typical library tasks. This site is maintained by Seth Allen, who produces most of the content. Guest writers are certainly welcome though! Please email me if you'd like to add your 'hack' to this site. I can't offer you money, but you will be lavished with praise and your work will be attributed. Please come back to this site often as new content will be added. Happy hacking!